Google+ launched Discover, a new way to find content and Communities from across Google+. The web navigation menu has been simplified, making it a bit more difficult to find Events and your own Collections. Google Allo is now available on desktop - sort of. 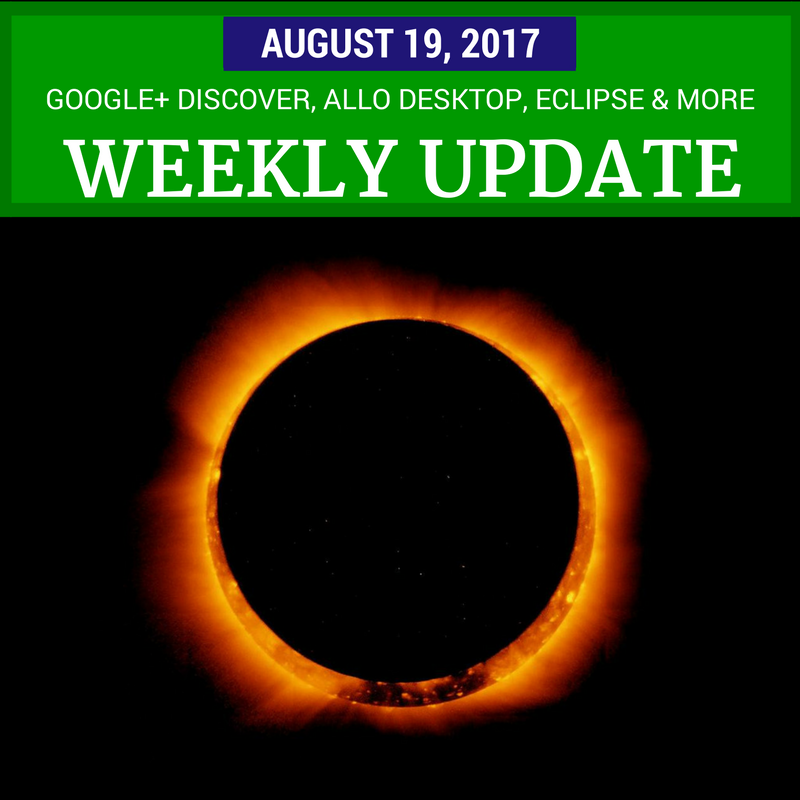 You need to be running the Chrome Browser and have your Android phone running Allo linked. Now you can use your Google Home to make phone calls hands free. Calls to the US and Canada are free, and calls to other countries are available for Google Voice and Project Fi customers. Android devices are getting a redesigned Google app with emphasis on topics and news. Plus there are video previews help you find what you're looking for faster. There are a bunch of new Google Docs, Sheets, & Slides features that improve team collaboration. Plus there are articles, tips and updates for video creators, live streamers, business owners, webmasters and much more. A total solar eclipse will be visible across the United States on Monday, August 21. Even if you aren’t in the path of totality, you can watch. On Saturday, August 12th white supremacists and neo-Nazis rallied in Charlottesville, Virginia. Counter-protester Heather Heyer was killed, and many people were injured. There was a surprisingly swift reaction from tech companies, who shut down payment accounts, web hosting and other online services for neo-Nazi groups. I’ve collected related links below. The Electronic Frontier Foundation has pointed out that not having - and following - a documented takedown process could make it easier for governments and companies to “silence legitimate voices”. And Tor argues that they "can't build free and open source tools that protect journalists, human rights activists, and ordinary people around the world if we also control who uses those tools." In some cases, it may be clear who the bad guys are, but that isn't always the case - do we trust tech companies to make the "correct" decision? I'm not sure we should.